(Newser) – It's the high-tech version of the old "carry an embarrassing sign around" punishment: A British judge yesterday ordered Apple to run notices on its UK website stating that Samsung didn't copy the iPad. The notices—which effectively act as ads for Samsung, points out a lawyer for Apple—must stay on the Apple site for at least six months and must also appear in British newspapers and magazines, Bloomberg reports. The order comes after the same judge's July 9 ruling that Samsung's Galaxy tablets don't infringe on the iPad's design, particularly because they're not as "cool" as the iPad. 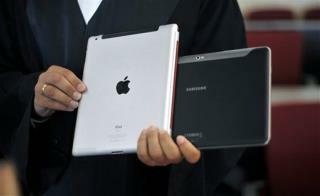 Apple's fear of Samsung's Galaxy tab is a great reason to buy one. It must be good for this level of panic. Well this case sure taken some sharp turns. Maybe this will put a chill on all these tech companies suing, counter-suing, counter-counter-suing each other all the time. well done ! too bad jobs isn't around anymore to take this righteous slap in the face.